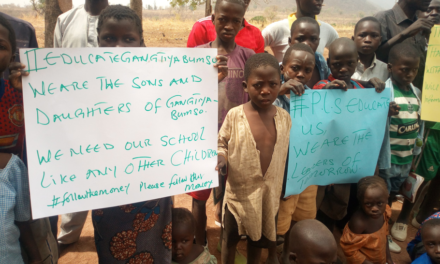 As 40 per cent of Nigerian children, aged 6-11, do not attend any primary school with the northern region recording the lowest school attendance rate, particularly for girls, the World Bank on March 8, 2016, decided to provide a $100 million grant for Katsina, Kano, Kaduna, Jigawa, and Sokoto. Furthermore, On May 4 2016, it was announced that, from the funds promised by the World Bank, they have committed $21 million to Kaduna State government, while on June 3, 2016, $12 million grant was provided by the Jigawa state government for the training of teachers, renovation of schools, provision of teaching materials and offering scholarship to students. As at this writing, none has been heard about how much was released or committed to Kano, Sokoto, and Katsina. It will be great if these government can come public on how much was committed by the World Bank (if any have been). 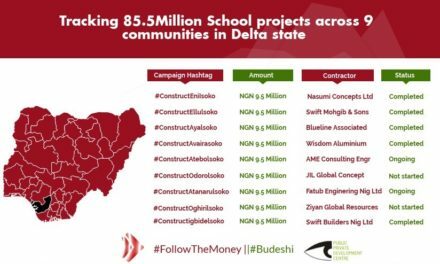 As this funds concern education, and furthermore, renovation of schools, our team thought it much as a project that interest us, and a Freedom of Information letter to request for a work plan and breakdown of the funds was dispatched from the core team on June 13, 2016, and was delivered by our community reporters to Kaduna, Kano and Jigawa State on July 12, 2016. With this development, the state government is put to test on the much talked about transparency and accountability of this young and nascent government, and just to quickly state, that it’s been 51 days and the government of Jigawa and Kano hasn’t responded to our request for information, while the Kaduna state government through its State Universal Basic Education Board has responded to our request (applaud), although it took 28 days! Response from the Kaduna State government shows that the project will last for the next 4 years and in Naira they have gotten a total of 697,783,307 Naira. 33% of the funds will be spent on the improvement of pre-primary school, while 16% and 17% will be committed to the support of teachers, and scholarship for female teachers respectively. 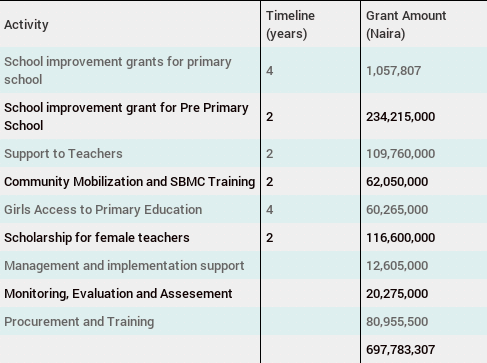 While looking through the breakdown, the team will be interested in infrastructures that will be provided for the school improvement grant for primary schools and pre-primary school, totalling 235, 272, 807 Naira, while reporting, we will also look out for the outcomes of the other activities.